18 Cue module for the FireStorm Firing System. The new FireStorm wireless firing system is a rugged, professional and user friendly firing system. The firing system is designed and supported by EasyPyro Ltd and manufactured to the highest quality standards in the UK. The system has been specifically designed for the safe, professional and reliable wireless control of fireworks and pyrotechnics. We believe our customers should strive to use the highest quality equipment possible, and we believe the FireStorm wireless firing system offers an extremely attractive option at an affordable price. We stress that the FireStorm firing system is of significantly higher quality, reliability and usability that other lower cost firing systems. As we manufacture FireStorm, we can also offer unbeatable after sales support and servicing. 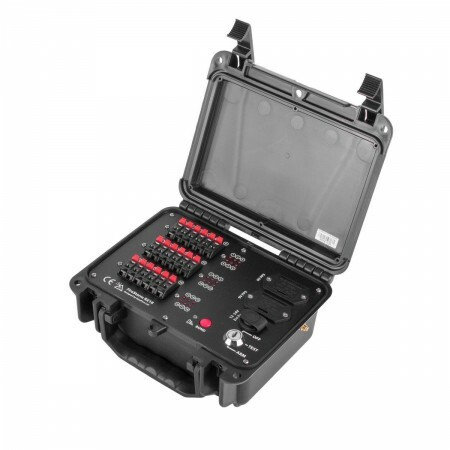 The RX18 Module is ideal for fireworks, outdoor use, stage effects, clusters of single hits, or any application where a rugged, high cue count Firing Module is required. The module is built into a small, very rugged case that allows the lid to be closed on the wires. This provides total protection to the electronics and controls on the firing module. The firestorm module also has a rugged aluminium front panel and allows the batteries to be changed easily. The module also has an external power jack to connect a 12 - 24v battery if required. This would allow more e-match igniters to be fired per cue than with the internal batteries, or power hungry devices such as confetti cannons, solenoid valves etc. The RX18 also has user replaceable terminal blocks and other parts. In the unlikely event you break a terminal, it can be easily replaced with just a screwdriver. The RX18 Firing Module is controlled from the TX1 or TX2 Transmitter. Built into a very rugged case. Small (221 x 191 x 99 mm) - large enough to be easy to use, small enough easily carry and store. Light (1 Kg / 2.2 Lbs). Slots in case allows e-match igniter wires to exit when lid is closed. Bi-Directional communication - just like FireStorm RX1 and RX6 modules. Antenna connector on outside of case. Removable antenna can be stored inside case. Metal arm / power key switch. In built continuity test and intelligent self-test. Easily changeable 2 x 9V batteries. 18V Output @ 6 Amps per cue (10 series e-match or 4 parallel e-match per cue). External DC power jack - connect a 12 / 24v external battery for extra firing power. User replaceable connector blocks and other parts.